WHAT IS TRAINING GROUND EAA? WHY USE TRAINING GROUND EAA? * Dessa uttalanden har inte utvärderats av Food and Drug Administration (Livsmedelsverket). Denna produkt är inte avsedd att diagnostisera, behandla, bota eller förebygga sjukdom. Dosering As a dietary supplement, mix one heaping scoop (7.1 grams) into 12 Oz of cold water in a shaker cup either before, during or after workout. 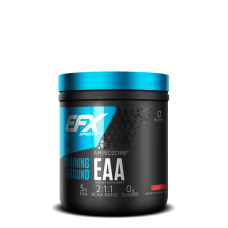 Innehållsdeklaration AminoZorb BCAA (Enzymatic buffered Leucine, Isoleucine, Valine 2:1:1)	2550 mg	, L-Lysine 1875 mg, L-Histidine 167 mg, L-Phenylalanine167 mg, L-Threonine 167 mg, L-Tryptophan 50 mg, L-Methionine	25 mg. Other ingredients: Citric Acid, Silicon Dioxide, Sucralose, Natural & Artificial Cherry Flavors, Beet Root Powder, and Acesulfame Potassium, Natural &amp Artificial Peach Flavors, Sucralose, Acesulfame Potassium, and Malic Acid.